Toshiba’s high-end A3 colour line-up is as impressive on the outside as it is on the inside. Its ultra-modern look houses the latest innovative technology, like brilliant quality delivered at up to 75 pages per minute in colour as well as at up to 85 pages per minute in monochrome. The Toshiba e-STUDIO 7506AC has a new high-quality 22.9 cm (9″) tablet-style multi-touch screen can be personalised according to a user’s preferences and needs. It starts with the background image, which can easily be exchanged and continues with personalised views. You can change the order of the icons on the home screen, add or remove buttons and decide how many icons should be displayed per page, so that all functions present themselves to you in a way most useful to you. The Toshiba e-STUDIO 7506AC model fulfils the highest security standards to protect your data from unwanted access. So whether you are looking for document security, device security or access security – our new system has it all. The Toshiba e-STUDIO 7506AC series helps workgroups connect, integrate and simplify while improving efficiency, productivity and the professionalism of presentations. 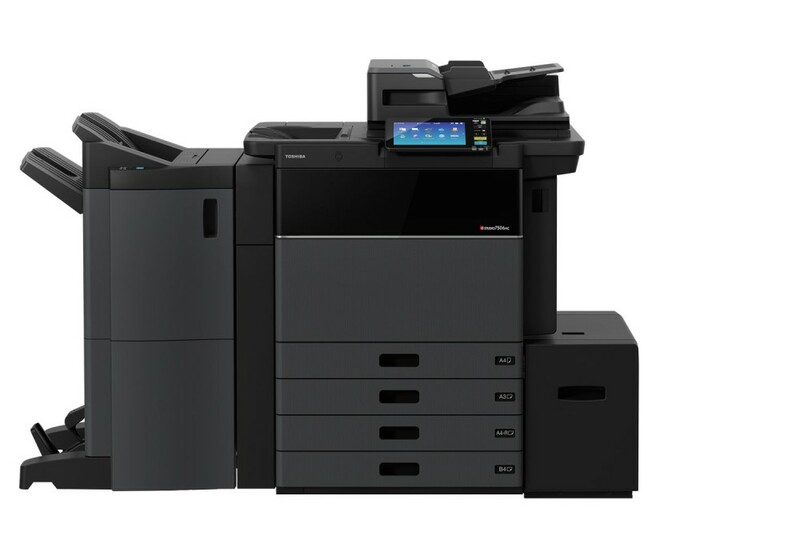 High, Robust Speeds 75 brilliant colour pages per minute and 85 monochrome pages per minute.